helsea and Arsenal on Sunday played to a goalless draw in an English Premier League (EPL) encounter that saw Chelsea defender David Luiz sent off for a rough tackle on Sead Kolasinac. Luiz was sent off came in the closing minutes of the match played at the Stamford Bridge and he could have no complaints about his dismissal after lunging into a crude two-footed challenge on the Arsenal defender. Nigeria’s Victor Moses got his marching orders in last season’s FA Cup final, while Pedro was dismissed in the Community Shield. 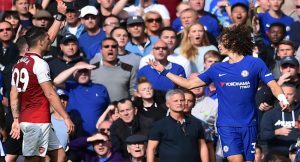 The Luiz flashpoint – Chelsea’s fourth red card this season – was the most memorable moment of a hard-fought London derby that was high on perspiration but low on inspiration. “We have great respect for officials, but it is strange to finish a third game in a row against Arsenal with 10 men,” Chelsea boss Antonio Conte said. After losing on their last five visits to Chelsea, Arsene Wenger’s side had the better of the few clear-cut chances. Luiz’s moment of madness came too late for Arsenal to capitalise on their numerical advantage, so they had to settle for a first clean sheet at Chelsea since 2005. “It was about mentality and a response from our last away game. We could have won it. It was an intense game,” Wenger said. It was another frustrating encounter with Arsenal for Conte’s men, who were beaten in both the FA Cup final and the Community Shield. Arsenal weathered an early storm before Welbeck wasted a golden opportunity when Hector Bellerin’s cross picked out the unmarked forward, who couldn’t adjust quickly enough to keep his header on target. Wenger’s men threatened again when Ramsey’s pass left Marcos Alonso isolated and put Bellerin in behind the Chelsea defence. Bellerin crossed low for Lacazette, but the France striker’s shot was too close to Chelsea goalkeeper Thibaut Courtois. The Gunners’ rearguard remained as creaky as ever and Cesc Fabregas sprung their offside trap with a precise pass to Pedro, whose tame shot at Petr Cech let the visitors off the hook. Encouragingly for Wenger, Arsenal were still picking holes in Chelsea’s usually rock-solid defence. They should have taken the lead just before halftime when Ramsey had only Courtois to beat after weaving his way past Cesar Azpilicueta and David Luiz. Shkodran Mustafi had the ball in the net for Arsenal, but the defender’s header was correctly ruled out for offside. As Chelsea’s frustration mounted, Luiz shrugged off Alexis Sanchez – on as a substitute – and launched into a needless lunge on Kolasinac in the 87th minute. He was immediately shown a red card by referee Michael Oliver. In another EPL Super Sunday encounter, Romelu Lukaku scored against his former club as Manchester United thrashed Everton to move joint-top of the Premier League. Captain Antonio Valencia’s early thunderbolt put Manchester United en route to a 4-0 Premier League victory over Everton, but they needed a flurry of late goals to finally subdue their unfortunate visitors. The result sent Everton into the bottom three and meant Wayne Rooney’s return to Old Trafford ended in a dismal defeat. “I think the performance was very good, especially int the first 30-35 minutes, it was probably our best performance of the season. “We pressed them and they did not have a chance to get out, they did not have a shot, it was very impressive. After that, Everton’s good players came out and showed their qualities. “They gave us difficulty but I looked behind me on the bench and saw alternatives,” Chelsea Manager Jose Mourinho said.